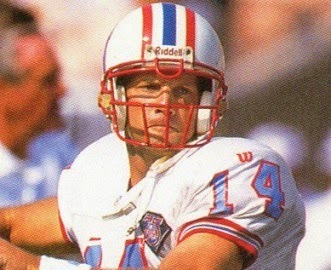 Following a fine career at Baylor, Carlson was chosen by the Oilers in the third round of the 1987 NFL draft. He saw no action as a rookie backup to Warren Moon during the strike-interrupted ’87 season. Valued for his size and arm strength, he proved to be a capable backup to Moon, starting five games when Moon suffered a shoulder injury in 1988, when he passed for 775 yards and four touchdowns. Carlson appeared in six games in ’89 and one in 1990 to close out the regular season, which garnered him AFC Offensive Player of the Week recognition. Stepping in for Moon in the postseason, the result was a loss to Cincinnati. A broken arm sidelined Moon during the 1992 season, again necessitating Carlson’s stepping into the starting role. Oilers went 10-6 to finish second in the AFC Central, while leading the NFL in passing yards (4029) and qualifying for the postseason as a wild card entry. Lost AFC Wild Card playoff to Buffalo Bills (41-38). Moon was briefly benched for poor play in 1993 and Carlson was also sidelined with a groin injury. With Moon’s departure in 1994, Carlson was handed the starting job with unsuccessful results. With questions arising as to his fragility, Carlson retired in 1995 after failing his team physical. Over the course of seven active seasons, mostly in a backup role, he passed for 4469 yards and 21 TDs with 28 interceptions. The Oilers went 11-8 in games that he started.